Reinvigorating a brand inside out. Hart Brown is a law firm with branches across Surrey and London. They wanted to strengthen their presence in key areas of their business in line with a new business vision. We shaped their brand DNA, refreshed their brand identity, created guidelines, marketing assets and messaging that reflects their strategic positioning. A strong and clear brand proposition, messaging strategy and brand identity for a law firm. 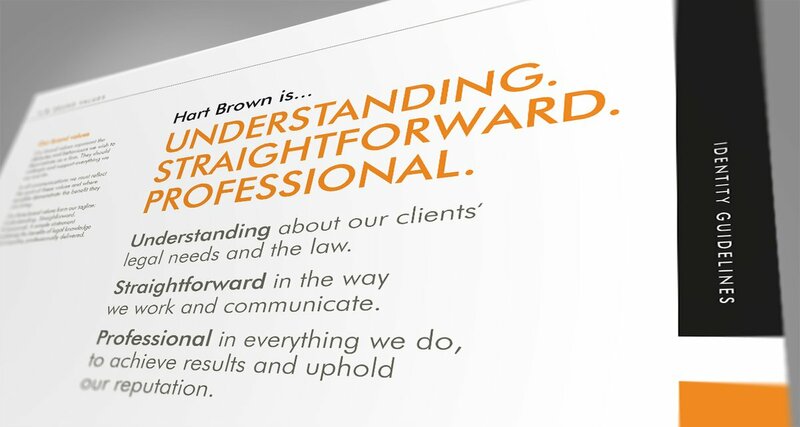 Hart Brown wanted to recalibrate and reinvigorate their brand by evolving their brand identity, messaging strategy and proposition to increase the profile of their commercial legal business services and aim towards High Net Worths. They wanted a stand out brand that resonates internally and externally, whilst retaining its heritage and values. We distilled their exhaustive list of brand characteristics into a clear brand DNA and proposition that was distinctly stronger and simpler. Hart Brown had a brand logo which they wanted to retain for its heritage, but wanted a way to update the identity in-line with their new business strategy. We injected gravitas by refreshing its brand identity without too much departure from the original. We created a strong messaging strategy and visual language to bring synergy across all its brand and marketing assets. This new identity was launched via an internal engagement campaign to renew the brand from within. This branding exercise had changed brand perception by giving a renewed sense of purpose and motivation from within the business.